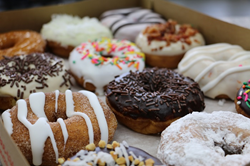 Russ DiGilio, founder and owner of Duck Donuts Franchising Company LLC, has announced the opening of his nationally celebrated donut franchise in the Mid-Atlantic region of Green Brook, New Jersey. The Green Brook location is the third franchise to open in the Garden State, following Avalon and Middletown. Duck Donuts: warm, delicious, and made-to-order. We are proud to deepen our roots in central New Jersey, and grow alongside such a strong, vibrant business community as Green Brook. New franchise owners Carrie and Scott Neigel are excited to introduce the first Duck Donuts franchise to Somerset County. The store is projected to open in early November at 215 Route 22 East, Green Brook, New Jersey, in Arthur’s Plaza. The 2,200-square foot location will feature select retail items with indoor and outdoor seating that reflects the franchise’s iconic beach theme and family-friendly atmosphere. Carrie is an active member of the Somerset Chamber of Commerce and is the primary manager of the Duck Donuts Green Brook location. The couple plans to open a second store in late 2017 in Madison, New Jersey. Located 18 miles southwest of Newark, New Jersey, Green Brook is home to the historic Washington Rock State Park, a 52-acre scenic state park on top of the first Watchung Mountain. Deriving its name from the powerful stream that flows up in the distant mountains, Green Brook has a population of over 7,200 residents. Donuts at this location will be made fresh to order 7 days a week: Sunday-Tuesday from 6 a.m. to 3 p.m., and Wednesday-Saturday from 6 a.m. to 6 p.m. Visit our Facebook page for updates and connect with us on the web at DuckDonuts.com. By 2011, Duck Donuts had expanded to four Outer Banks locations and the donut business was so successful that DiGilio was continuously approached about franchise opportunities and by fans who begged for a Duck Donuts in their communities. The first franchise opened in Williamsburg, VA, in 2013 and there are now 26 open franchise locations and 110 signed contracts.